Dropping in today to say Happy New Year!!! I wish for all of you a Blessed year!!! I love looking back to see what I have been up to creatively in the last year, so thought I'd post my favorites. And, I cannot forget this one- Go Cubs!!! I hope to spend a bit more time creating in 2017- wish me luck!!! Wishing you Christmas Blessings. Also, Happy Hanukkah! I cut out the die in Navy and attached it to a sheet of cardstock covered with 2" sticky tape. Next, I added Snow Glitter from Sparkle and Sprinkle. I added a faceted rhinestone to the center of the star, and added tabs with rhinestones on the sides. 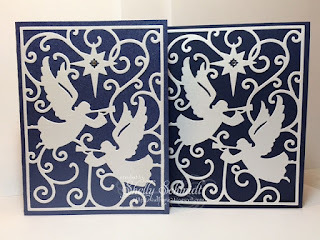 I love the way this turned out- it is one of those cards that looks better in person. 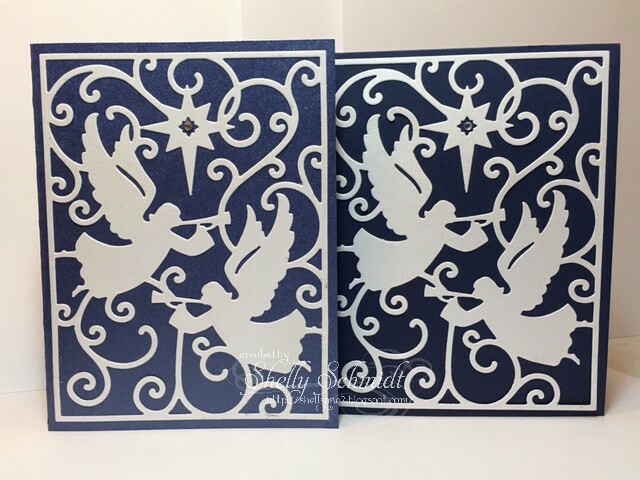 I decided to cut out the die in white shimmery cardstock and add it to a navy blue cardstock background. One of the Navy's is shimmery, the other plain. I love the way both of them looked. I added a faceted rhinestone to the center of the star. 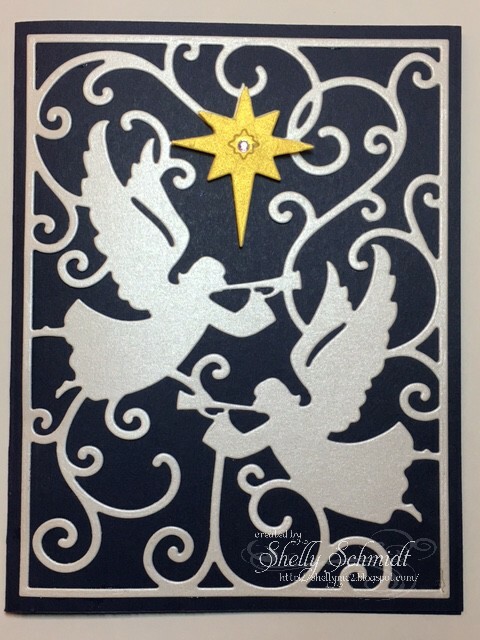 I made this just like #2, but die cut a shimmery gold star, and the words Noel in gold as well for the inside. My computer went in for repair today- I am going to be on cell only until I get it back. I will do my best to get around to blogs until I get it back! Thanks for stopping by! Many Blessings to all of my friends in blogland! 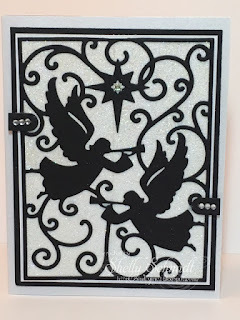 This pretty ornament is from Michael Strong Stamps. It is embossed using Gold Fire Opal EP. I added a die (that just arrived in the mail) from Die-Versions. I die cut it in Gold, then the leaves in green and the poinsettia in Cherry Cobbler. I added Gold stickles to the poinsettia center. And, rhinestones to the open circle areas in the die. I colored silver rhinestones with R39 Copic marker to get just the right color : ) I also added some YR24 to rhinestones for the Cherry Cobbler (red) layer with the ornament. 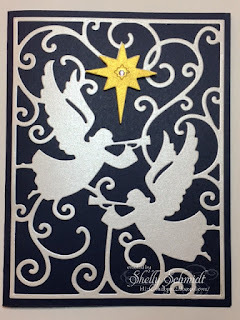 The background is my pretty shimmery cardstock that is from a resale shop, and it is embossed using the SU poinsettia EF. I made the ornaments with the technique I posted yesterday. (The ornament comes in 2 sizes). 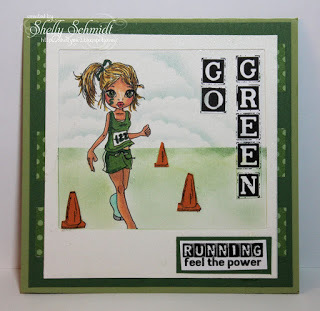 I cut out greenery with a Cheery Lynn Designs die. The sentiemt is embossed in Gold Fire Opal EP by Embossing Arts. 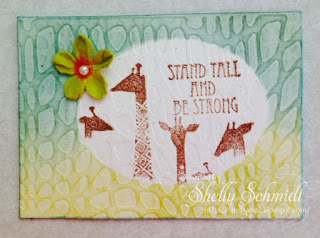 I colored on the stamp and using my Misti : ) stamped the image. Next, I cleaned the stamp and applied Versamark. I embossed the image- you can use clear EP or Stardust. 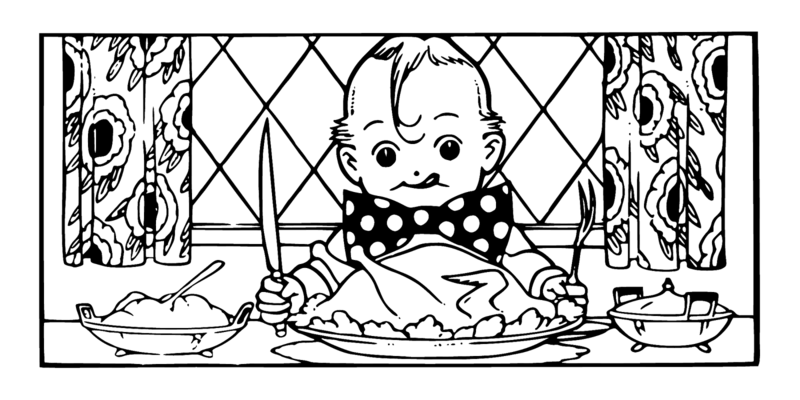 Image is Michael Strong and Sentiment Creste with TLC. For day three of me being 'Card Captain' for the Michael Strong Yahoo group, I decided to make a Christmas card for a sweet blogging friend. 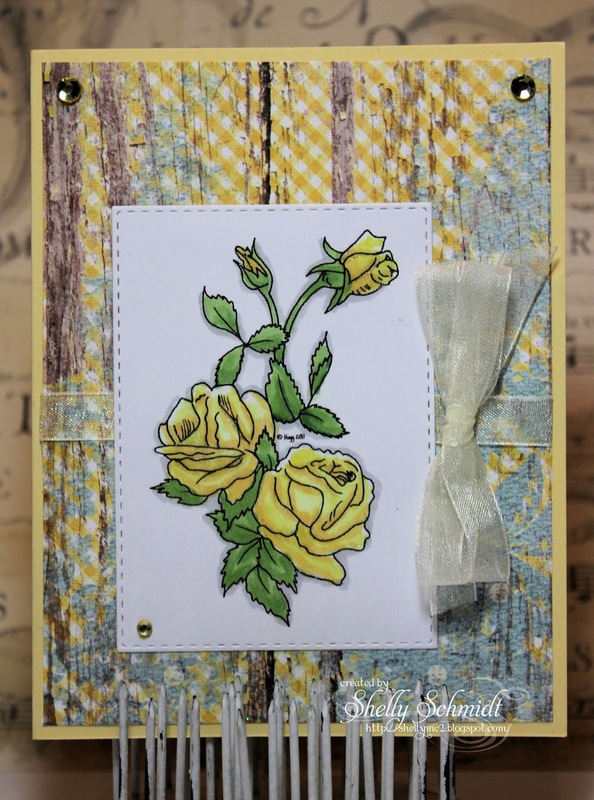 The sentiment is from Create with TLC, and the flowers are from the Mini Shapes set from Michael Strong stamps. The (flowers) mini shapes have a die set that cuts the shapes. 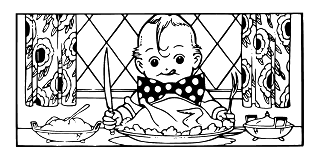 This is what it looks like with the template on top. I draw little circles in the holes, remove the template. Next, place the die over the flower with the holes lined up and viola- flowers cut out! I trimmed into the flower petals and curled them with my 'pokey' tool. I mounted them on a dimensional. The rhinestone centers are silver/clear colored with Copic YR24. 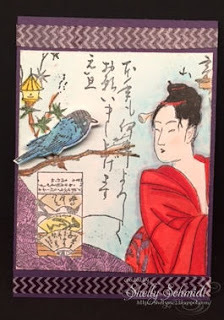 Today, I used the stamp set called Cloisonne Accents from the Michael Strong collection. This is a fun little set that comes with (2) squares and (2) circles. 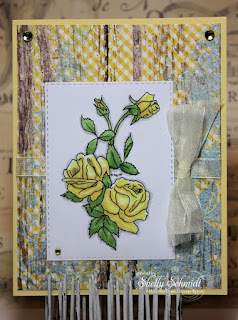 I used the same square- on 4 of these little squares, I embossed using Gold EP. On the remaining four, I stamped in red ink, then stamped in Versamark and embossed using Stardust EP. The sentiment is Paper Smooches. I used SU Real Red CS,, the Gold is from Marco Paper, and the shimmery white CS is from a resale shop. The rhinestones are recollections- I colored them with a Copic marker. 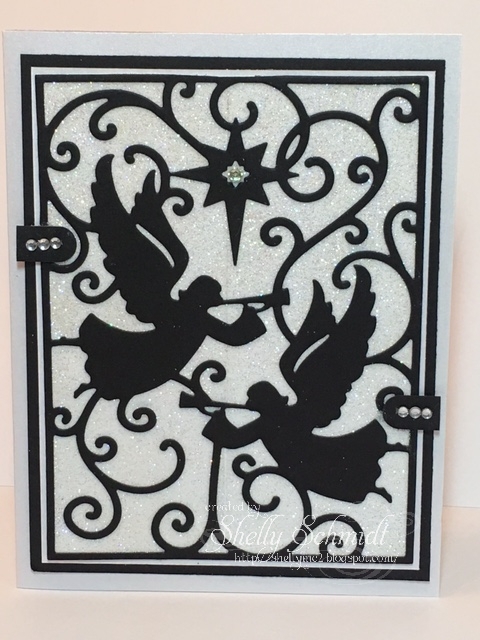 I had a challenge to make a card that was black plus one color- I used a retired SU color Baroque Burgandy. 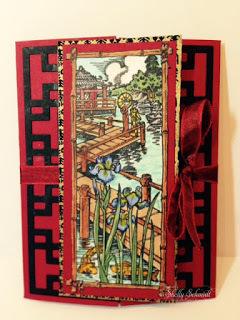 I used a stamp from the Cloisonne Cranes set. The crane is embossed in black and adds a little texture to the top layer. It's a Holiday feast, and this little guy is patiently awaiting the moment where he can dig in! The main meal is turkey with stuffing, some mashed potatoes and I am sure a whole lot more! For my card, I colored with Copics, DP is SU as are the punches for the sentiment. The button is also SU. 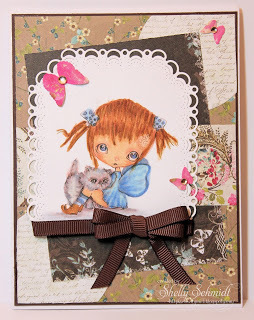 The ribbon and twine- unknown- from my stash. 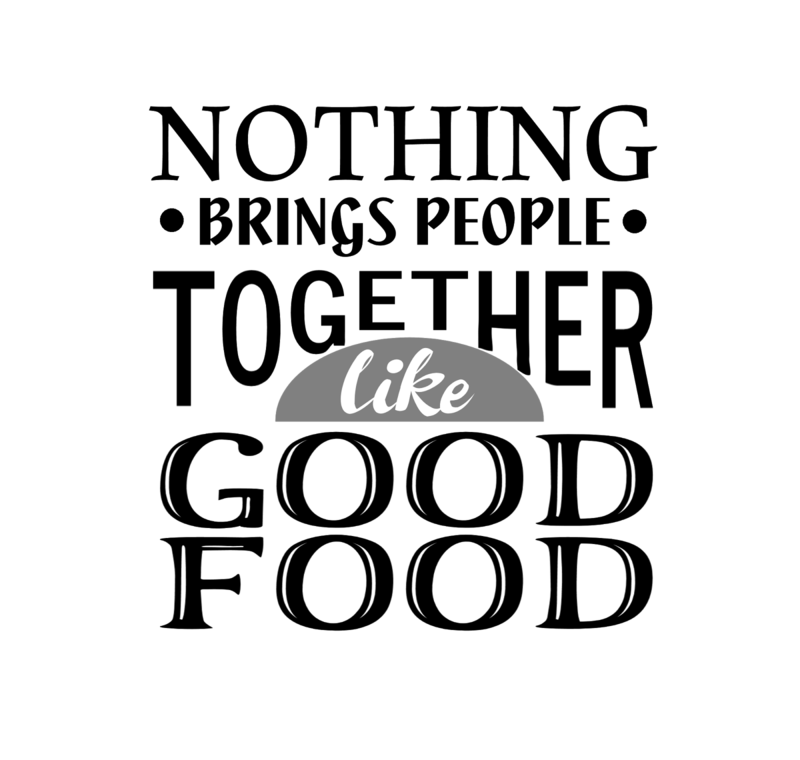 The sentiment is also a freebie- you can just right click and save the images to your file. Paulette is so very generous- please do finish up the hop at the main blog and drop her a note of Thanks! If you just dropped in, please go to Deanne's blog where the Hop begins. Enjoy!!! And, hope this wets your appetite for some creativity!